The essence of plants bursts forth in magnificent hues and surprising palettes. Using dyes of the leaves, roots, and flowers to color your cloth and yarn can be an amazing journey into botanical alchemy. In Eco Colour, artistic dyer and colorist India Flint teaches you how to cull and use this gentle and ecologically sustainable alternative to synthetic dyes. India explores the fascinating and infinitely variable world of plant color using a wide variety of techniques and recipes. From whole-dyed cloth and applied color to prints and layered dye techniques, India describes only ecologically sustainable plant-dye methods. She uses renewable resources and shows how to do the least possible harm to the dyer, the end user of the object, and the environment. Recipes include a number of entirely new processes developed by India, as well as guidelines for plant collection, directions for the distillation of nontoxic mordants, and methodologies for applying plant dyes. 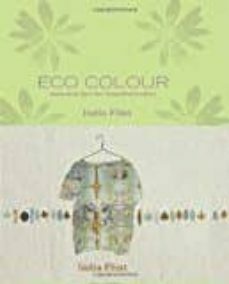 Eco Colour inspires both the home dyer and textile professional seeking to extend their skills using India's successful methods.